Ann is the mother of two daughters and one son, and the grandmother of four grandsons (including twin boys) and two granddaughters, both of whom are her namesakes. When her children were in college, she decided to complete her own education, enrolling in the University of North Carolina at Asheville where she earned a Bachelor’s degree in Literature. Reluctant to return to an empty nest, she continued her education by enrolling in the English Department of the University of North Carolina at Chapel Hill, where she earned both the Master’s and Doctor of Philosophy degrees. 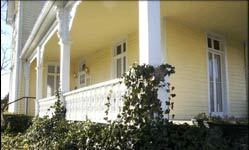 Afterwards, she taught Literature and the Humanities at the University of North Carolina at Asheville. 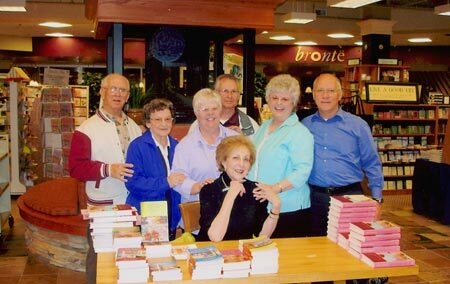 Ann’s writing career began in the early eighties when two mysteries were published as original paperbacks: The Murder Cure and The Murder Stroke. A few years later, her first hardcover book was published: The Pilgrimage, an adventure story set in the nineteenth century. All three books are now out of print, but occasionally a used copy of The Pilgrimage appears on Amazon.com for sale. 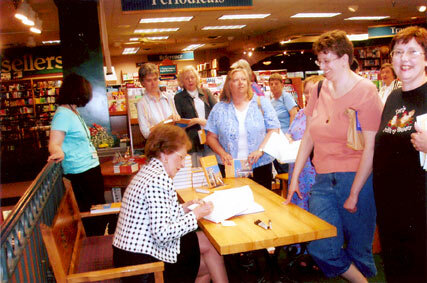 The publication of the first Miss Julia book, Miss Julia Speaks Her Mind in 1999, set Ann on a full-time writing career. This book went through six reprintings in less than a year, and was ranked #9 on the Independent Booksellers’ seventy-six most highly recommended books for 1999. 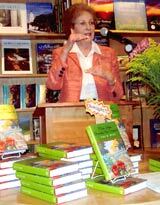 In addition, the book was named to the Barnes & Noble Discover Great New Writers list. The paperback edition of the same book was listed in The Best Books of the First Five Years by BookSense, as one of the titles independent booksellers most enjoyed handselling. The book was also published by Readers Digest Condensed Books, appearing in twelve foreign languages. Miss Julia Takes Over was one of seven nominees for the Book of the Year Award (2001) by the Southeastern Booksellers Association. All of the books in the series are available on audiotape and in large-print editions, and are also available through The Literary Guild/Doubleday Book Club. All of the books, except the newest one each year, can be found in paperback editions. Miss Julia Throws A Wedding, Miss Julia Hits The Road, Miss Julia Meets Her Match, Miss Julia's School of Beauty, Miss Julia Stands Her Ground, Miss Julia Strikes Back and Miss Julia Delivers the Goods have all appeared on the New York Times Extended Bestseller List. All of the books in the series will be published in German, Japanese, and Croatian editions, as well as on audio CD (in English) and in large print editions. Inspiration for the escapades of Ann’s much-loved character, Miss Julia, comes in all manner of ways–a chance remark by a friend or family member, an incident she happens to see, in a dream, or by being reminded of something in her past experiences. It is always deeply satisfying to her when scenes in the book she is working on suddenly seem to fit together to make a good story. She does not outline or make detailed plans before starting a story. She does, however, have a general plot in mind before beginning to write, but this usually entails only the conflict and the final resolution, with few ideas of how they will be worked out. So, with just the beginning and the end of a book decided on, Ann relies on the characters themselves to fill in the middle with first one subplot after another. This, she says, is the joy of writing–-when a character suddenly does or says something unexpectedly, leading her to funny and surprising ‘mini-scenes’ that seem to delight readers. Ann was once asked by an interviewer how she knew when something she’d written was good. She replied, “I know it’s good when I fall off my chair laughing.” From that response, we can be sure that she enjoys writing about her characters as much as we enjoy reading about them. ©Copyright 2001- Ann B. Ross. All rights reserved.